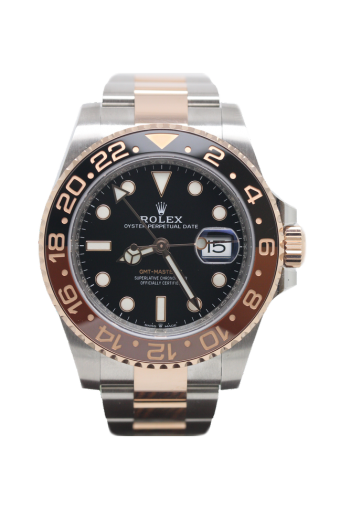 This stunning Rolex GMT with multi timezones and date functions. The 40mm watch case is a steel with 18ct rose gold crown and rotating bezel.The oyster bracelet is 18ct rose gold and steel whilst the dial is classic black to contrast the chocolate and black ceramic bezel inset. The Cheshire Watch Company are supplying this UK watch complete with all boxes and Paperwork which is dated 2018.